Academy Award® nominated, Golden Globe, Grammy and Tony Award-winning performer, Hugh Jackman, has announced the Australian leg of his The Man. The Music. The Show. WORLD TOUR which commences in August this year. Produced by TEG DAINTY the tour will see Jackman perform a new show with hit songs from The Greatest Showman, Les Misérables and more from Broadway and film, accompanied by a live orchestra. 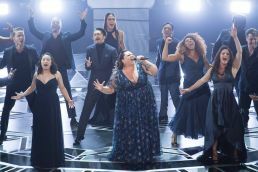 Making a very special guest appearance on the Australian tour is actress and singer Keala Settle who will perform the Academy Award® nominated and Golden Globe Award winning song “This Is Me” from The Greatest Showman and more. Sydney tickets on sale Thursday, March 7 from 10am local time. Adelaide tickets on sale Thursday, March 7 from 9am local time. Melbourne tickets on sale Thursday, March 7 from 12noon local time. Perth tickets on sale Thursday, March 7 from 10am local time. Brisbane tickets on sale Thursday, March 7 from 10am local time. Tickets for Hugh Jackman’s The Man. The Music. The Show. Source: Hugh Jackman’s The Man. The Music. The Show.